The mole is one of the most representative plates of the Mexican cuisine and without a doubt one of the recipes that has more variations. It is also served with countless presentations across the length and breadth of the country. This salsa is the result of the miscegenation of the Prehispanic cuisine and the European influence. 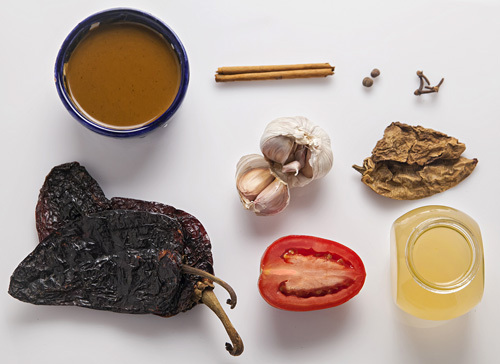 The original mole is known as “Puebla Style Mole" that is very elaborated and it has a very long list of ingredients. This recipe is a simplified version of that mole and it can be a great culinary start, if you had never prepared a mole at home. As in the traditional recipe a selection of dried chilies are combined with other ingredients to obtain a spicy and aromatic salsa. Less sweet than the original but with a great richness in aromas and seasoning. The best option is to serve it over some cooked chicken pieces and accompanied of a Mexican rice and the freshly made tortillas cannot be missed. Although all the moles are elaborated and they require time and attention in their preparation, this is one of the simplest that there is. The original recipe is given with lard. If you want it can be substituted with vegetable shortening. Prepare the chicken stock that is required in the preparation so the mole will have a more sophisticated flavor. The chipotle peppers that are used in this recipe must be dried. The preparation time is of 50 minutes . The recipe is for 10 portions. Remove the veins and the seeds of 12 mulato peppers, 15 ancho peppers and 20 dried chipotle peppers. Put on a griddle over medium heat all the chilies with the ones you worked and roast them for about 2 minutes, until all their sides are lightly roasted; move them regularly with some tongs. Transfer from the griddle to a blender, with the tongs, all the chilies that were roasted; then set aside. Transfer from the griddle to the blender, with the tongs, the 2 tomatoes that were roasted and reserve. Remove from the griddle the garlic head and wait until it cools a little. Separate the garlic cloves from the garlic head that was roasted and peel them; upon completion put them in the blender. Mix the saucepan ingredients and bring the simple Puebla style mole to a boil over high heat. When the simple Puebla style mole boils reduce to low heat and cook it for about 30 minutes, until it thickens and acquires a more intense color; stir occasionally. Suggestion: When the mole is served add some roasted sesame seeds . They will give an exquisite touch to the dish and they will serve as garnish. Variation: As you mastered this preparation now you have to prepare the traditional Puebla style mole. Did you like the Simple Puebla Style Mole? If you are having trouble getting the dried chipotle peppers, these are of very good quality. These anise seeds are the ones that best seasoning will give to your mole. Feel all the Mexican tradition by preparing the mole in a clay cazuela.